"Wow the quality of this fan controller is just amazing. The finish of the front panel has an extremely high quality sleek black metal finish. The knobs are my favorite, just the feel of them screams out quality, they are completely solid metal and no plastic at all. 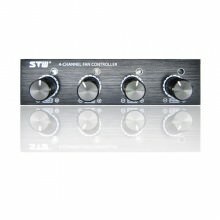 In all my life i have never felt a smoother turn of a knob, it is smooth yet has the perfect amount of resistance so it does not have a cheap feel like some other fan controllers. Also the blue led's are not just a typical blue, they are a flourescent high quality blue that you only see in very expensive technology. Also the fan controlling aspect itself is AMAZING, they control all four of my 120mm fans perfectly, there is a very large range of how much you can control them. At first i was scared it would not offer enough power but wow, it can run all four fans at full speed perfectly." Click the button below to add the 3.5 Inches Fan Controller - 4 Channel Fan Conntroller to your wish list.